We stock an extensive range of Snow Helmets and Goggles by brand leaders Smith Optics and Bern. A helmet is an important part of your gear and of late, is fast becoming a legal requirement in a number of Ski resorts. In time it is expected that ALL Ski resorts will follow suit on this. That said there are still a few of us that prefer just to wear a beanie and while the law in some resorts still allows then that’s your call. All our Snow Helmets all conform to the EN1077 , or the American standards ASTM 2040 or Snell RS-98 Snow Helmets standard. We would recommend that children ALWAYS wear a helmet as we are sure you are aware, a knock to the head can have far reaching consequences when they are at such a young age. A helmet can give you and your family piece of mind when on the slopes. All our helmets are chosen for their stylish design, protection, functionality and goggle compatibility. Don’t be tempted to wear a regular bicycle helmet helmet as they are not designed withstand the cold temperatures and can easily crack and could invalidate an insurance claim if you were unlucky to sustain a head injury while wearing one. Take a soft measuring tape and wrap it around your head about 1 inch above your eyebrows and ears. Most helmets are measured in centimeters, so unless you love calculations, measure your head in centimeters. For example, if you measure the circumference of your head and it is 56 cm, you will wear a 56 cm helmet or Medium (55-59cm) depending on the helmet’s size scale. You want your goggles to fit comfortably with your helmet. Your goggles should fit comfortably with your goggle strap over the helmet. There should be no gap between the top of your goggles and the helmet; this is referred to as a “goggle gap” or sometimes “gaper gap” or “punter gap” Besides, “goggle gap” can give you a brain freeze. (most common) “Single Impact” – Helmets with EPS constructions necessitate replacement after a single crash or drop from 2+ feet. (less common) “Multi Impact” – Helmets with EPP constructions are designed to withstand multiple mild to moderate crashes. The other common impact absorbing material used in ski/snowboard helmets is EPP (expanded polypropylene). 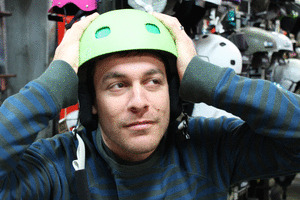 Helmets constructed with EPP liners are generally rated for “multiple impacts.” Although they have a slightly lower safety threshold than their EPS compadres, EPP helmets are increasingly common amongst freestyle/park skiers and snowboarders as they don’t necessitate replacement after a single crash. So if I never crash, I don’t need to worry about helmet replacement? Not exactly. Most experts in the field recommend replacing your helmet after 3-5 years of use. This is primarily due to material breakdown as a result of exposure to sweat, hair products, cleaning chemicals, and exposure to the elements. Many companies — like Bern, & Smith — have crash replacement programs that are worth your consideration when buying. These programs typically involve a significant discount on a replacement helmet after being compromised by a fall. Regardless of these programs, it’s important to note that while helmets might seem expensive, they’re certainly cheaper than the potential medical bills and life-long trauma caused by an otherwise preventable head injury.